It was probably Dubai's grandiose extravagance which first led to the United Arab Emirates showing up on most travel radars. But there's a lot more to this collection of seven emirates and many of the best places to stay in the United Arab Emirates can be found in lesser known spots. In recent years it's become a lot easier for visitors to see more of the UAE, outside the confines of the Western style resorts, so the UAE is now a lot more than a destination for winter sun and shopping. Visitors should definitely shop in Dubai's souks, ride a camel in Abu Dhabi and go snorkelling or diving on the coral reefs of the gulf. 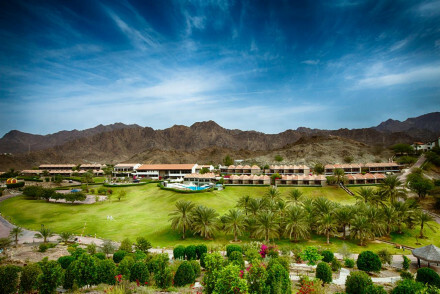 Some of the western-style resorts are still the best places to stay in the United Arab Emirates: but it's also worth heading out into the desert to see the amazing desert dunes and the grand wadis of the north-east, or into the photogenic Hatta mountains. The real magic of the UAE is how an Islamic state can find its peace with the nightclub parties which finish just before the calls to prayer, and the rampant fantastical consumerism. But the balance holds. And all this exists alongside traditional Bedouin customs and oceans of sand. This is probably one of the world's most diverse and interesting nations. Where to stay - which emirate? Abu Dhabi is the capital of the UAE and its second largest city. It offers visitors a good combination of beach and culture, and this is where you'll find the huge Grand Mosque, the Louvre's middle east outpost and of course the Abu Dhabi Grand Prix. It's a big business destination too. Dubai is the largest city in the Emirates and probably the best known. It is a hugely family friendly destination, with so much to do from water parks, to souks, to shopping malls and watersports, that you are completely spoilt for choice. But it also has a certain authentic charm - just take a trip to the Deira district and the Dubai Museum and you'll find out more. Ras al Khaimah is the most northerly emirate, and is best known for its beaches. It is far less glamourous than its ritzier siblings above, but it has a certain Arabian charm and a much more unspoiled feel. If you want the sun and sand, but without all the bling, then this is the emirate for you! Abu Dhabi's hugely impressive Sheikh Zayed Grand Mosque boasts more than eighty domes, four minarets over a hundred metres high, one thousand pillars and prayer space to accommodate forty thousand. And that's just the outside; inside is all gold, marble, semi-precious stones and crystal. The Burj Khalifa is, needless to say, an enormously impressive experience. Standing at 830m tall, head up to the observation deck to tick off a classic bucket-list experience! If you're interested in the UAE of pre-oil days you'll probably find the abandoned fishing village of Jazirat Al Hamra fascinating. This spot was first settled in the 14th century, its inhabitants surviving on fishing and pearl diving, but the entire population upped sticks in 1968, leaving everything spookily empty, but well preserved. Dubai is the obvious choice if you're looking for a luxurious city break. Here no excess is off the table; there are malls with not just a selection of cinemas, but also a ski jump slope. Of course there's also the world's tallest building, and 'The Palm' - the artificial island in the shape of a palm tree which glitters with glamorous resorts. The Armani Hotel in the Burj Khalifa is sleek, modern and luxurious, with many pools, stunning views, excellent restaurants and an immaculate spa. The Address Downtown Dubai offers the ultimate in luxury skyscraper extravagance with seven swimming pools, a top-notch spa and a slew of award-winning restaurants. And there's great views over the Burj Khalifa. 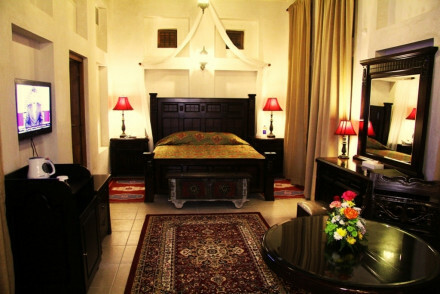 The Ahmedia Heritage Guest House offers something a bit more traditionally Arabic, with wonderful Persian style fabrics, antique four-poster beds, a lovely courtyard and an art gallery. Atlantis the Palm crowns the Palm Jumeirah. Flamboyant and luxurious, this is the kind of resort which has so much on offer you'll not have time to leave - including its own aquarium and water park. The Jumeirah Zabeel Saray is a bit less Disney, but with just as much luxury and spectacular sea views. The Jumeirah beach hotel is that beautiful wave building you see in the Dubai brochures, with great views of the mighty Burj. This is easily one of the best places to stay in the United Arab Emirates for families - it also has its own water park, but it's a bit less hectic than Atlantis. The Qasr Al Sarab in Abu Dhabi is the perfect spot to fulfil your Arabian Nights fantasies, a luxurious desert palace in the heart of the Liwa Desert. 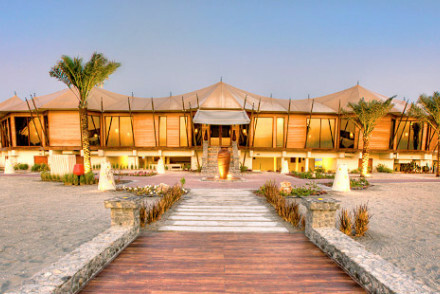 The Banyan Tree Ras Al Khaimah Beach looks like a Bedouin camp, with its huge tent-like buildings, and this really adds to the feeling of remoteness. Of course, you'll also find every luxury - good food, a huge complex of pools and spas and its own beautiful beach. The Banyan Tree Al Wadi is similar but on a larger scale, and of course it's got a desert outlook rather than a beach one. Alternatively try Dubai's Desert Palm, this emirate's version of a secret desert hideaway, but with a top notch spa, terrace overlooking the polo fields and more facilities than you can imagine. You're spoilt for choice if you're flying in to the UAE - choose from Dubai International Airport, Abu Dhabi International Airport, Sharjah International Airport, Al Maktoum International Airport among others. It's probably best to visit during either the spring (April - May) or the autumn (September - October) as the weather's pleasant and hotel rates are cheaper. The summers are hot and humid, whilst winter is peak tourist season. 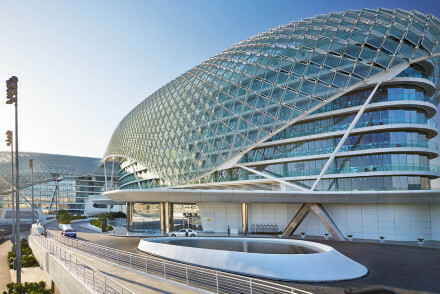 A sleek modern and buzzing hotel with an incredible location straddling Abu Dhabi’s Yas Marina Formula One Circuit. Numerous dining options, roof top bar, nightclub and two rooftop pools. A luxury stay close to all the amenities of the marina complex and the airport. Spa - Luxurious ESPA with treatment rooms offering a wide range of massages and therapies. Swimming Pool - Two outdoor rooftop pools. One is adults only. Desert romance and sophisticated luxury in the dunes. Gorgeous rooms and suites in muted tones in the style of Arabian Nights, twinkling swimming pools dotted around the hotel, fabulous food, and an impeccable spa. A Bedouin fishing village style luxury beach retreat in a remote setting. Rooms and suites filled with contemporary elegance and seaside romance. Excellent restaurant and spa, huge pools, and water sports galore. Luxury on a smaller scale than usual for UAE. A veritable Bedouin oasis of luxurious exoticism. No expense is spared in this haven of bare-foot luxury in the middle of the desert. Honeymooners will be attracted by the private villas (the only accommodation type) with their own pools, and the private bbqs or sand dune evenings available.